Uyen is a first generation immigrant and refugee, coming to the United States at eleven years of age. Her career has followed a typical path; earning her degrees in Pharmacology at UC Santa Barbara, her MS in Biomedical Sciences from UC San Diego, and her MBA specializing in entrepreneurship and venture capital from UC Berkeley. Things finally got interesting when Uyen went to work as an Investment Officer for CalPERS, one of the largest pension funds and investment portfolios in the world where she helped to ensure Californians received great pensions and healthcare. After spending several years in the arid brownness of California, her desire for greener pastures and her need to be closer to family led her to accept an assignment as Director of Investment for Mekong Capital, a private equity firm focusing on mid-growth consumer businesses in Vietnam. After several years of “green pasturing” in 100% humidity, Uyen relocated to Seattle where she accepted a position as Product Manager at where else…….Amazon! Finally, after completing her mission at Amazon and now firmly established in Seattle, yet still unwilling to discard her love of travel & an international lifestyle (see: eat lots of different foods and learn about various cultures), Uyen co-founded Nue. Now her days are spent doing everything under the sun to keep Nue functioning and making it a great place for both guests to visit and employees to work. With all that, she still finds time to video chat with her nephews 5 times a day while also trying to change the world through chairing boards for charitable causes and performing volunteer work for several humanitarian agencies. Chris has been scouring the corners of the globe for exciting food and drink for over 25 years. From the jungles of Kalimantan to the foothills of the Atlas Mountains, there's literally nothing edible he's discovered that he hasn't been thrilled to eat...or at least try. Always an entrepreneur, Chris started his first company, designing marketing materials and 3D animations for businesses while still earning his degree. After college, and wanting a fresh, creative outlet, he joined the growing video games industry, working as a 3D environment artist on numerous PC and Console titles. During all of this, his unrelenting drive for international travel and food kept him continuously cooking and exploring. 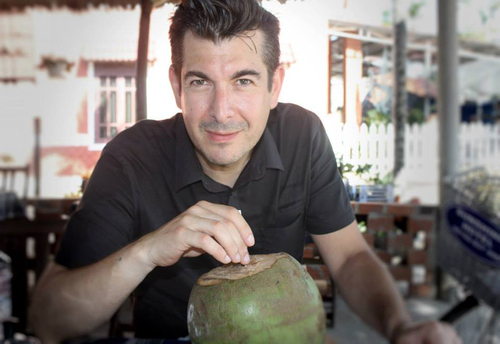 Finally wanting to meld his dedication for food and art, Chris founded, and continues to run Animation Kitchen, a 3D animation studio with a focus on the Food Science Industry. Clients of Animation Kitchen include the Culinary Institute of America and CHOW, among others. His hobby blog, Thingsaboutfood, is all for fun and as such, is written to introduce readers to quirky ingredients and techniques that may seem new and unfamiliar, but are readily available in American's own "backyard". At the end of 2013, about mid-way through a 3 month, 22 country road trip throughout Europe, it became apparent to him that opening a restaurant was the next, logical step. Perhaps seeming 'logical' was due to the hypnotizing effects of driving through long stretches of Bulgarian corn fields, or quite possibly an artifact of the low-grade, head-buzz one gets from drinking too much Slovakian Burčák but regardless, Nue is built, ingredients have been sourced and excitedly, there's no turning back. Born and raised in the Midwest, Chef Brad Kostelyk’s deep appreciation for international flavors and cuisine started to develop at a very young age….he simply didn’t realize it at the time. Growing up in a Dutch/American family of six, dinnertime meant simple, utilitarian, one-pot meals which although well cooked, satisfying and filling, always left him wondering if somewhere there might be ‘more’. At the age of 16, Brad’s ‘flavor quest’ inspired him to begin his culinary journey and he began working at a small family run, Italian café. It was there that he was first exposed to ‘exotic’ new ingredients and unfamiliar cooking techniques, finally giving him a taste of truly flavorful food. It was at this point he recognized that he could never ‘go back’, cooking was his passion and made the decision to attend culinary academy. 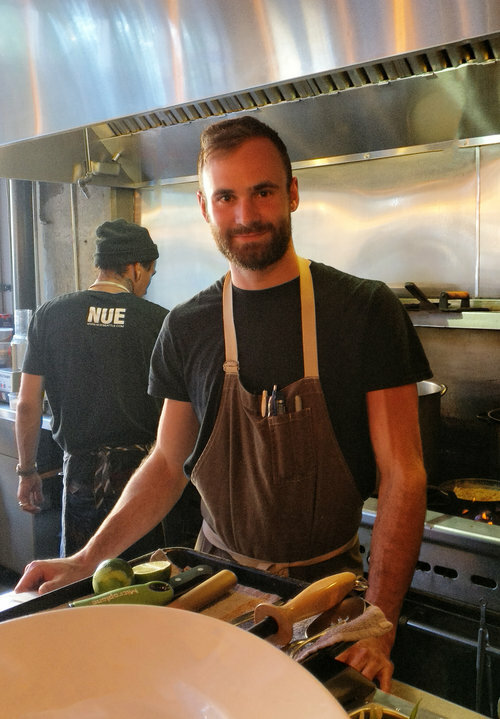 After graduation, and continuing study and growth in a variety of kitchens throughout the Chicago area, Brad realized he was now ready for something new. In 2013 Brad took his first trip to the Pacific Northwest and instantly fell in love with both the landscape and culinary climate. Within the year he packed up his knives, purchased a rain slicker and made the move out west. Perhaps it was the fresh air, the utter lack of sunshine or maybe it was simply being somewhere new but soon after arriving he realized that something else had changed. Having spent his entirelife in the flatness of the Central Plains and his entire career in classic European restaurants, he now craved exploring both the mountains and coastline that makes up the PNW as well as the diverse ingredients and ethnic influences that make up its rich culinary landscape. It was this curiosity that led to his first encounter with Nue and with it, sparked an immediate desire to become part of the kitchen. Now, leading the team and working with unique product and ingredients, he finally has the opportunity to share his now sated ‘flavor quest’ with the world.